American Indians comprise 6.2% of the population in Montana, but represent about approximately 17% of the motor vehicle crash deaths in the state each year. 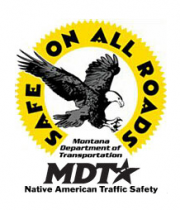 In an effort to spread the safety message in Tribal communities, Montana Department of Transportation (MDT) developed the Safe On All Roads (SOAR) program. This is a traffic safety education program that provides strong and meaningful messages relevant to the individual culture of each community. Coordinators living and working in the community manage their local program and assist in developing appropriate education material. SOAR Coordinators partner with, Tribal Council Members, Judges, Law Enforcement, Injury Prevention Specialists, Tribal Health, Tribal Transportation, local Tribal DUI Task Forces, and other traffic safety stakeholders in their community. Local SOAR Coordinators who are members of the community and who promote traffic safety locally are some key factors that make this program a success. They provide tailored messages regarding seat belt use, impaired driving, and child passenger Safety to best reach Tribal members. The Montana Department of Transportation is deeply committed to reducing crash deaths and injuries on the reservations in Montana. The department initiated the SOAR program to reduce highway fatalities through education and community outreach on Montana Reservations. Montana, as a whole, ranks at or near the bottom in the nation every year for traffic safety. There are more impaired driving and unrestrained fatalities per capita than almost all other states. Over the last five years, there were anywhere from 52% to 73% Native American impaired driving fatalities, and 68% to 87% unrestrained fatalities. The five-year average for Native American impaired driving fatalities was 61% and 76% for unrestrained fatalities. The overall goal of this program is to reduce the five-year average number of Native American fatalities to 32 by 2020. Currently the five-year average is 38. 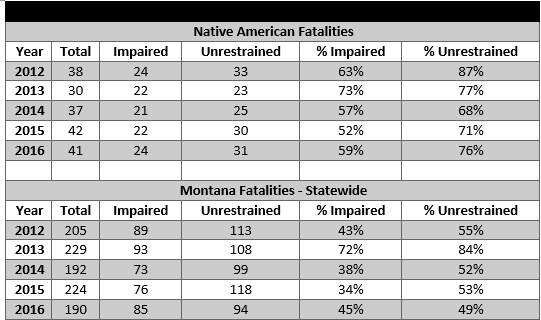 Other than a slight increase in 2016, impaired and unrestrained Native American fatalities have been declining as a percent. The five-year average of impaired driving fatalities dropped from 71% during 2015 to 61% in 2016. In addition, preliminary numbers for 2017 indicate there were only 31 total fatalities. These are successes for the program and will make achieving the 2020 goal possible. Posted in Blackfeet Reservation, Clinical & Community Preventive Services, Crow Reservation, Flathead Reservation, Fort Belknap Reservation, Fort Peck Reservation, Northern Cheyenne Reservation, Rocky Boy’s Reservation and tagged Car safety, community outreach, drinking and driving, education, MDT, montana, prevention, program, Public Health, Reservations, rural, SOAR, Traffic safety.